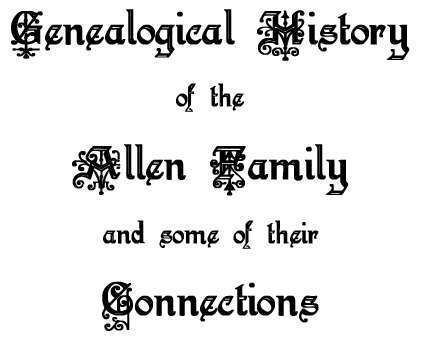 The book, "Genealogical History of the Allen Family and some of their Connections." Compiled by Mrs. Frances M. Stoddard, this book was privately printed in Boston in 1891. 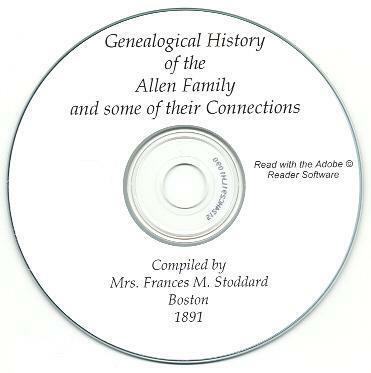 It is filled with genealogical and personal information about various Allen families. Please note: This is not a paper book, it is a scan of the original paper book into the digital Adobe PDF format, written on a CD-ROM. You read this book on your computer using the free Adobe Reader software. It is a digital version of a hard to find book. Jonathan Adams, Mary Adams, Dora Aldrich, John H. Alfred, Albert Allen, Alice Allen, Amelia Allen, Amelia T. Allen, Ann Allen, Anna I. Allen, Anna M. Allen, Annie Allen, Ann Maria Allen, Ansel Cady Allen, Arthur H. Allen, Arthur W. Allen, Benjamin Allen, Caleb Allen, Caleb J. Allen, Carolina Allen, Carrie L. Allen, Charles F. Allen, Charlotte Allen, Charlotte R. Allen, David Allen, Dorcas Allen, Dorcas B. Allen, Douglas M. Allen, Edward Allen, Edward C. Allen, Eleanor Allen (2), Eleanor C. Allen, Elizabeth Allen, Elizabeth C. Allen, Elizabeth W. Allen, Ellen I. Allen, Emily Allen, Emily A. Allen, Emily C. Allen, Emily H. Allen, Emily M. Allen, Emma Allen, Eunice A. Allen, Eunice J. Allen, Florence F. Allen, Florence L. Allen, Frances E. Allen, Frances T. Allen, Francis W. Allen, Frederick Lee Allen, Frederick Lewis Allen, George Allen (2), George R. Allen, Gertrude E. Allen, Grace de Silver Allen, Harriet A. Allen, Helen Allen, Henry H. Allen, Henry J. Allen, Henry N. Allen, Henry S. Allen, Henry W. Allen, Horatio C. Allen, Horatio N. Allen, James Allen, James A. Allen, Jane C. Allen, Jane D. Allen, Jane E. Allen, Jeanie Allen, Jesse B. Allen, Jirah L. Allen, Johanna Allen, John Allen (2), John B. Allen, John C. Allen, John H. Allen (2), John P. Allen, John W. Allen, Jolley Allen, Jonathan H. Allen, Joseph Allen, Joseph J. Allen, Josephine Allen, Joshua Allen, Julia A. Allen, Launcelot Allen, Leela Allen, Leonard A. Allen, Lewis Allen, Lewis D. Allen, Lewis F. Allen, Lillian M. Allen, Lucretia C. Allen, Lucretia I. Allen, Lucy Allen, Lucy J. Allen, Lucy M. Allen, Lydia E. Allen, Maria B. Allen, Marianne H. Allen, Martha A. Allen, Martha H. Allen, Mary Allen, Mary A. Allen, Mary C. Allen, Mary D. Allen, Mary F. Allen, Mary I. Allen, Mary S. Allen, Nancy Allen, Nathaniel Allen, Nathaniel H. Allen, Nellie Allen, Otis Allen, Pardon T. Allen, Raynor H. Allen, Richard Allen, Samuel Allen, Samuel N. Allen, Samuel T. Allen, Sarah Amelia Allen, Sarah Ann Allen, Sarah B. Allen, Sarah S, Allen, Sebastian L. Allen, Stanley W. Allen, Stephen H. Allen, Thomas Allen (2), Thomas C. Allen, Thomas H. C. Allen, Thomas J. Allen, Thomas M. Allen, Thomas R. Allen, Thomas W. Allen, Wait H. Allen, Walter W. Allen, William Allen (2), William A. Allen, William A. W. Allen, William M. Allen, William T. Allen, Wilson Allen, Alfred H. Ames, Allen Ames, Anna M. Ames, Fannie C. Ames, Leonard Ames, Lucretia Arnold, Edward M. Atwater, Lizzie Atwater, Maria Atwater, Hannah Avery, Mary H. Avery, Sabria Avery, and Thomas Avery. Charlotte M. Babcock, Elizabeth Babcock, Henry N. Babcock, Henry S. Babcock, Theodore Babcock, Theodore S. Babcock, Charles N. Bailey, Georgiana Bailey, Sarah E. Bailey, Albert D. Barnes, Amelia Barnes, Arthur K. Barnes, Carolina O. Barnes, Helen J. Barnes, Henrietta F. Barnes, Henry A. Barnes, James Barnes, John Barnes, Lillian G. Barnes, Lulu J. Barnes, Mabel L. Barnes, Martha A. Barnes, Milton B. Barnes, Samuel T. Barnes, Turner M. Barnes, Walton W. Barnes, William E. Barnes, Wilmer P. Barnes, A. J. Bartlett, Mary A. Bartlett, Benjamin Batte, Jane Batte, Jeanie S. Batte, Matia Bixby, Frank A. Bixler, Jane E. Bixler, William Bixler, Adele M. Bielier, Charlotte L. Boyd, David Bolles, Frances A. Bolles, Frances M. Bolles, Gertrude J. Bolles, John Bolles, John E. Bolles, John N. Bolles, Lucius Bolles, Lucius S. Bolles, Lydia A. Bolles, Lydia T. Bolles, Nicholas Bolles, Sarah N. Bolles, William C. Bolles, John Boswell, Sarah H. Boswell, Elizabeth Bourne, Sarah Bourne, Thomas Bourne, Dorcas Bowes, Martin Bowes, Elizabeth Bowman, Margaret Braddock, Lucretia Bradley, Elizabeth A. Brubaker, Ellen A. Brubaker, George S. W. Brubaker, Henry C. Brubaker, James F. Brubaker, Lewis A. Brubaker, Mary E. Brubaker, Mary T. Brubaker, Waldo T. Brubaker, William M. Brubaker, Emily W. Brumley, Lucy H. Bullock, Mary Burch, Nicodemus Burch, Sarah Burch, George R. Burroughs, Harriet C. Burroughs, Horace W. Burroughs, John Burrows, Margaret Burrows, Charles C. Button, Harriet Button, Jane C. Button, Lucy T. Button, Worthington B. Button, and Caroline Butts. Ansel C. Cady, Clarence W. Cady, Frederick L. A. Cady, Harriet A. Cady, Elizabeth Carey, Eliza Champlain, George Champlain, Samuel Champlain, William Champlain, Charlotte H. Chandler, Emily Chandler, Emily C. Chandler, Harriet T. Chandler, John Chandler, John W. Chandler, Mary Chandler, Randolph Chandler, Randolph W. Chandler, Sarah B. Chandler, Sarah H. Chandler, William H. Chandler, Amasa Child, Annie F. Child, Elizabeth Christophers, Lucretia Christophers, Richard Christophers, Annie H. Church, Cornelius Church, Daisy T. Church, James C. Church, James W. Church, Lucy A. Church, Maude B. Church, Miriam W. Church, Thomas Clap, Elizabeth Colfax, Harriet Colfax, Jonathan Colfax, Robert Colfax, Sarah Colfax, Mary Clarke, William Clarke, Amy Colt, Kate A. Conkey, James Cooper, Susan E. Cooper, Alice D. Cowgill, Allen P. Cowgill, and Warwick M. Cowgill. Charlotte Edgerton, James Edgerton, Sarah Edgerton, Ellen E. Edson, Emily A. Edson, Fanny A. Edson, Hannah Edson, John M. Edson, Mary U. Edson, Obed Edson, Samuel Edson, Walter H, Edson, Annie Emery, Joseph Emery, Joseph S. Emery, Lucy J. Emery, Maria Emery, Samuel Emery, and Sophia Emery. Christopher E. Gadsden, Sarah Gibbons, William Gibbons, Henry Gibson, James A. Gibson, Sarah C. Gibson, A. Malinda Gilbert, Joseph A. Gilbert, Lillian Gilbert, Morgiana Gilbert, Emme E. Gilpatrick, Marcus L. Gilpatrick, Ebenezer Goddard, Lydia Goddard, Adelaide Goodwin, George H. Goodwin, Mabel A. Goodwin, Elizabeth Grant, John Griffin, Phebe Griffin, and Meriel Gurdon. Emily Haley, Stephen Haley, Anna W. Handy, Truman B. Handy, Elizabeth Harris, Thomas Harris, John Haynes, Marianne Hitchcock, Mary Homan, John Howland, Charles Hubbell, Emily H. Hubbell, Annie Huntington, Elizabeth Hurlbut, Joseph Hurlbut, Lydia Hurlbut, and Phebe Hurlbut. Jirah Isham, Lucretia Isham, and Sarah S. Isham. Gertrude Janney, Earl of Jersey, Phebe Jewett, Caleb Johnson, Eunice Johnson, Fannie Johnson, George P. Johnson, Lucy Johnson, Lydia Johnson, Robert Johnson, abd Sarah A. Johnson. Emily M. Keith, Alice Kent, George L. Kent, and Matilda J. Kent. Anne Langhorn, John Langhorn, Edward Learned, Elizabeth Learned, Sarah Learned, Isaac Ledyard, Wait Lippett, Lucretia P. Loomis, Elisha Lord, and John Loyd. Imogene Manley, Sarah Mann, Lucy Manning, Abigail Marvin, Reinold Marvin, Cally McCausland, Harold A. McCausland, Royal B. McCausland, Elizabeth C. McGregor, John McGregor, John B. McEwin, Marie McEwin, Mary McEwin, Carrie L. Meeker, Archibald Mercer, Carrie L. Mercer, Edith W. Mercer, Eleanor C. Mercer, Eleanor P. Mercer, Ellen A. Mercer, Frederick W. Mercer, Harriet Mercer, Harriet W. Mercer, John D. Mercer, Mary S. Mercer, Thomas A. Mercer, William S. Mercer, William A. Mercer, Susanna Moor, Albert H. Morgan, Alva Morgan, Emily W. Morgan, Enoch Morgan, Harriet Morgan, John W. Morgan, Lucretia Morgan, Mary H. Morgan, Prudence Morgan, Sarah E. Morgan, Sidney Morgan, Theophilus Morgan, David Mumford, Rebecca Mumford, and Thomas Mumford. Elizabeth Nash, Mary Noyes, and Sarah Noyes. Andrew Palmer, Sarah Palmer, Statira Palmer, Martha Park, Alice B. Parker, Louisa W. Parker, Mary D. A. Parker, William B. Parker, Abigail Parsons, Jonathan Parsons, Lois Parsons, Marshfield Parsons, Albert C. Patterson, Arthur B. Aptterson, Edith C. Patterson, Ethel A. Patterson, Frances A. Patterson, George H. Patterson, Henry R. Patterson, Juliet C. Patterson, Mary F. Patterson, Ruth A. Patterson, William C. Patterson, Mary A. Pearman, Adele M. Perkins, Allen Perkins, Ellen Perkins, George H. Perkins, Harriet A. Perkins, Lizzie B. Perkins, Marion Perkins, Mildred Perkins, Thomas G. Perkins, Charles Phinney, Harriet N. Phinney, Henry R. Phinney, Lucretia I. Phinney, Lula A. Phinney, Mary A. Phinney, Sarah F. Phinney, John Picket, Mary Picket, Judith Pratt, and Pauline Prince. Juliet C. Rathbone, James Richards, Jerusha Richards, John Richards, Albert Richmond, Amelia T. Richmond, Emily Ripley, Eunice A. Ripley, Henry Ripley, Mary Ripley, Robert Ripley, Samuel Ripley, Samuel W. Ripley, Elisha Roberts, Matilda Roberts, Matilda Rockwell, Elizabeth Rosewell, William Rosewell, Carolina Rouailly, Frances M. Rowe, Laura A. Rowe, and Stanhope Rowe. Ann Saltonstall, Deborah Saltonstall, Elizabeth Saltonstall, Gilbert Saltonstall, Gurdon Saltonstall, Jerusha Saltonstall, Katherine Saltonstall, Mary Saltonstall, Nathaniel Saltonstall, Richard Saltonstall, Samuel Saltonstall, Winthrop Saltonstall, Frances Seabury, Samuel Seabury, Epenetus Sears, Julia A. Sears, Bella Shackelford, Blanche Shackelford, Isabel Shackelford, John Shackelford, William Shackelford, Elizabeth Shackmaple, John Shackmaple, Lydia Shackmaple, Richard Shackmaple, Sarah Shackmaple, Denison Smith, Dorothy W. Smith, Edward Smith, Edward L. Smith, Elizabeth Smith, Erastus T. Smith, Frances M. Smith, Frances T. Smith, Gilbert Smith, Gilbert A. Smith, Hannah Smith, Isaac Smith, Jabea Smith, Jesse D. Smith, Lucina Smith, Lydia Smith, Martha H. Smith, Mary D. Smith, Nathan Smith, Nehemiah Smith, Oliver Smith, Prudence M. Smith, Sarah Smith, Waty Smith, Waty B. Smith, Mary Stanton, Abby Starr, Eliza Starr, Elizabeth T. Starr, Jonathan Starr, Rebecca Starr, Sally Starr, Helen Stimson, Jeanie Stimson, M. R. Stimson, Alice K. Stoddard, A. Malinda Stoddard, Caroline Stoddard, Charles E. Stoddard, Charlotte M. Stoddard, Enoch V. Stoddard, Frances M. Stoddard, Frederick E. Stoddard, George Stoddard, George K. Stoddard, George V. Stoddard, Guy A. Stoddard, Harriet Stoddard, Henry H. Stoddard, Henry L. Stoddard, Henry P. Stoddard, Ida L. Stoddard, James Stoddard, James H. Stoddard, James K. Stoddard, John V. Stoddard, Kate A. C. Stoddard, Julia A. Stoddard, Mabel C. Stoddard, Margaret E. Stoddard, Mary A. Stoddard, Mary D. Stoddard, Mary P. Stoddard, Prentice S. Stoddard, Prudence Stoddard, Ralph P. Stoddard, Sabria Stoddard, Sarah Allen Stoddard, Sarah Ann Stoddard, Sarah C. Stoddard, Sarah O. Stoddard, Susan E. Stoddard, Thomas V. Stoddard, Vine Stoddard, Virginia T. Stoddard, William O. Stoddard, and Lord Robert Seymour. Amelia Taber, Amy C. Taber, Charlotte Taber, Elizabeth Taber, Emma Taber, Frances Taber, Henry Taber, Jane Taber, Luanna Taber, Mary Taber, Merc Taber, Naomi Taber, Pardon Taber, Pardon T. Taber, Phebe Taber, Philip Taber, Albert Tait, Helen Tait, James A. Tait, James G. Tait, Julia Tait, Olivia Tait, Moses Thompson, Thomas Thompson, Virginia Thompson, Lucy Thurston, Annie A. Tracy, Charles A. Tracy, Charles W. Tracy, Frank M. Tracy, Mary F. Tracy, Albigence W. Tucker, Edward A. Tucker, Frances E. Tucker, George A. Tucker, Isabel Tucker, Jane A. Tucker, Lewis A. Tucker, and Mary E. Tucker. Lois Wait, Richard Wait, Ann Wanton, Joseph Wanton, Elizabeth Ward, Eleanor Warren, Henry Warren, Abigail Waterman, Ebenezer Way, Elizabeth Way, Mary Way, Thomas Way, Adelaide Webb, Annie A. Webb, Charles L. Webb, Charles M. Webb, Edward B. Webb, Edward G. Webb, Elizabeth S. Webb, George C. Webb, Henry C. Webb, Josephine R. Webb, Judith P. Webb, Loring Webb, Manetta B. Webb, Marian H. Webb, Mary C. Webb, Sarah A. Webb, Theodore A. Webb, Theodore H. Webb, Phebe Westcote, Harriet Wheat, Dorothy Wheeler, Isaac Wheeler, Martha Wheeler, Morgiana Whidden, Charlotte H. Whitman, George L. Whitman, Bennett Whitney, Bessie W. Whitney, Eben Whitney, Sarah A. Whitney, Susan Whitney, Mary Whittingham, William Whittingham, Charlotte Wilson, Elizabeth Wilson, Louis Wilson, Maria Wilson, Sally Wilson, Sarah Wilson, Thomas Wilson, Lydia Winchester, Rebecca Winthrop, Abraham Wood, Albert Wood, Albert B. 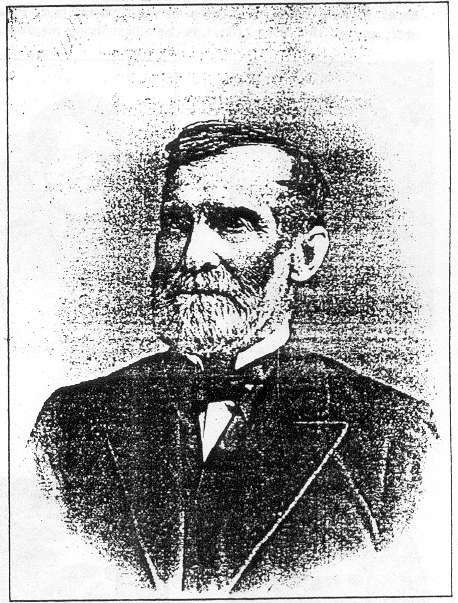 Wood, Emily C. Wood, Emma A. Wood, Michael Wood, Samuel Wood, William Wood, Jane D. Woodruff, Mary Woodruff, and Truman Woodruff. The book has about 135 pages. 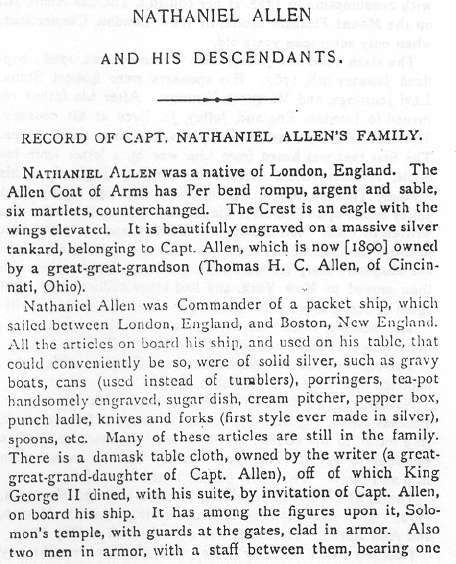 There are numerous photographs and illustrations of Allen ancestors. It contains many stories, anecdotes, wills, etc, for Allen folks and those of allied families. Please note: This is a scan of a Xerox copy of the original hard to find book - so the images are not very good quality. 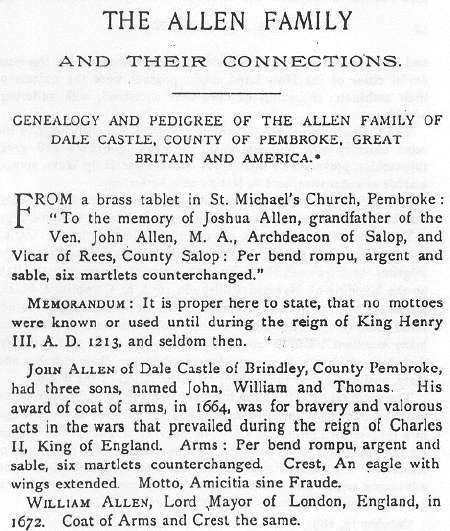 Don't miss the chance to get this great family and genealogical reference!